Do I need to know a lot about plants to join? Or have a big garden? No! Our members have diverse backgrounds when it comes to gardening—we have beginners, master gardeners and everything in between! Some members have huge gardens while others live in a condo or apartment. So, does the garden club just focus on flowers? Any topic related to nature or community is fair game! Here are just some of the things we’re exposed to: Birds, wildlife, insects, water management, landscaping, history, parks, education, fellowship, gardening events, trends, other non-profits, and the list goes on and on! I love flowers! What kinds of gardening activities do you offer? The three clubs hold 10 meetings a year (Sept.—June) at which a gardening program is usually scheduled. This activity could be anything from a guided park tour to a presentation on making holiday flower arrangements to preserving herbs from your garden! The 3 clubs meet together twice a year at the WGWGA spring and fall meetings—which include a program as well. We also encourage members to attend District, State and National level meetings; all of which have fantastic learning opportunities. Lastly, we discuss local gardening events unrelated to our organization—we want to stay in the loop! The clubs schedule their own meetings and programs. Members of each club volunteer to host at their homes but sometimes the meetings take place “offsite” (the meeting might take place at a field trip location). When all three clubs get together twice a year for our Association meetings, we typically go to a larger venue such as a local restaurant or meeting facility. I know your big fundraiser is the plant sale. How do you use the proceeds? We have an educational outreach program that lets any Webster school apply for a grant that facilitates horticultural learning projects. The schools have done incredible things with the funds—we’ve donated over $25,000 total since the program started! 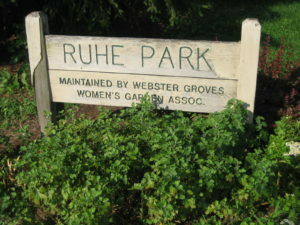 We also partner with the city to beautify and maintain Ruhe Park. It just received a huge facelift in 2015/2016 and we were able to pay for a percentage of those costs! You can email us at [email protected] or contact the following: Association President Gerry Singer at [email protected]or Association Membership Chair Jan Dolan at [email protected]. Remember that clubs 4 and 5 meet during the day (Club 4 on the 3rd Wednesday of each month at 11:00 except December which is the 2nd Wednesday. Club 5 meets the 3rd Friday of each month at 10:30). The day club meetings last at least 3 hours because they include a meeting, lunch, and program. Group 23 meets at night—7:00 p.m. on the third Wednesday of each month. All clubs meet for 10 months—September through June.